Dallas, TX (Restaurant News Release) Bennigan’s – the Legendary brand known for its chef-driven American fare and friendly Irish hospitality – has struck gold and is elevating its fall experience with the debut of its new seasonal menu. 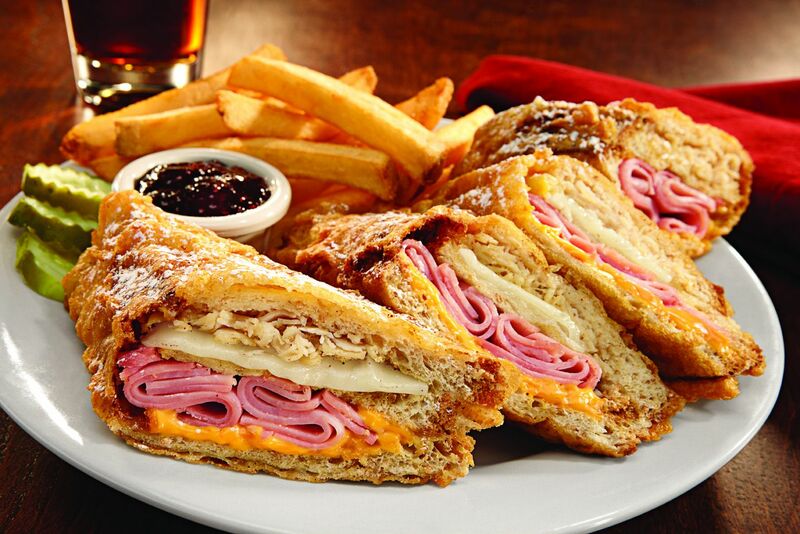 World Famous Monte Cristo – Honey wheat bread layered with tender ham, roasted turkey, Swiss and American cheeses, batter-dipped, gently fried and coated in powdered sugar. Served with red raspberry preserves for dipping. Many have tried, and none can duplicate Bennigan’s secret recipe! Oktoberfest Burger – Sensational half-pound burger layered with cheddar cheese and seasoned grilled onions, drizzled with zesty Sam Adams Octoberfest Biergarten mustard on a toasted brioche bun. Served with homestyle French fries seasoned with sea salt. Pair with a true pint of Sam Adams Octoberfest. Reuben Burger – A juicy half-pound burger layered with chopped corned beef, sauerkraut, Swiss cheese, 1000 Island dressing and served on a toasted rye bread. Served with homestyle French fries seasoned with sea salt. Housemade Cottage Pie – A fan favorite, this savory casserole is made with ground beef, sausage, onions, mushrooms, carrots, tomatoes and fresh herbs topped with Parmesan-toasted garlic mashed potatoes. Irish Maple Mule – The Irishman Founder’s Reserve Small Batch Irish Whiskey, fresh lime juice, maple syrup and Gosling’s ginger beer. Served in a copper mule mug with a fresh lime wedge and mint sprig. Spiced Irish Cran–Apple – Writer’s Tears Copper Pot Irish Whiskey, Deep Eddy Cranberry, DeKuyper Sour Apple Pucker and Fireball Cinnamon Whisky. Topped with cranberry juice and apple juice. Celtic Lemonade – The Irishman Founder’s Reserve Small Batch Irish Whiskey, Midori Melon Liqueur, Finest Call Premium Lemon Sour, Minute Maid® Lemonade and Sprite®. Served in a mason jar with fresh lemon wheels. Apple Pie Martini – Disaronno, Fireball Cinnamon Whisky, DeKuyper Sour Apple Pucker and apple juice. Served in a martini glass, rimmed with cinnamon sugar. Autumn Sangria – Stoli Razberi Vodka, Fireball Cinnamon Whisky, Pacific Bay White Zinfandel, Finest Call Peach Puree and Red Bull® Orange Edition. Served in a mason jar with an orange and lemon wheel. Refreshingly fall! Sam Adams Octoberfest – A malt lover’s dream, masterfully blending together five roasts of barley to create a delicious harmony of sweet flavors including caramel and toffee. The beer is kept from being overly sweet by the elegant bitterness imparted by the German Noble hops. Rodney Strong Sonoma County Cabernet Sauvignon – Rich with dark cherry, plum and baking spices. The delicious fruit is accompanied by black pepper notes, crushed violet and cassis. The palate has medium tannins, lingering spicy oak flavors with a velvety lush finish. Pairs beautifully with any meat dish. Bennigan’s is experiencing aggressive growth around the world to satisfy the strong demand for its signature menu items. Since the end of 2012, the company has opened new franchise locations in Mandan, N.D., Clarksburg and Frederick, Md. ; Sacramento, Calif.; Melbourne, Fla.; Monahans, Texas; Lexington, Ky.; Veracruz, Mexico; Larnaca, Cyprus; Obarrio, Panama; Doha, Qatar; and Dubai, UAE. Additional restaurants are coming soon to Steubenville, Ohio, and Memphis, Tenn.; and internationally in Guatemala, Honduras, El Salvador, Amsterdam and Pakistan, with more than 100 additional locations in development.